Looking for something new and exciting in Bethlehem? Being a college town, it has plenty of new places for you to check out. Just last month, a new festival and the reopening of a legendary restaurant were announced. This new festival will be held from noon to 4 p.m. on July 24 at the Bethlehem’s SteelStacks campus in the ArtsQuest Center at Levitt Pavilion and PBS39's Public Media Center. The event is free and will include a farmers’ market, cooking demonstrations, and activities for kids. The festival’s will also include a Tasting Room (in ArtsQuest Center's Musikfest Café), but entry does require tickets ($25-$50). You’ll get to sample dishes from 30+ local food vendors and restaurants and drinks from local wineries, distilleries, cideries, and breweries. Demonstration and workshops will include beekeeping, gardening, and cheese-making. George’s Light Lunch, which served the area for more than 60 years on West Broad Street, closed in 2014 having been sold and set to open at a new location at a later date. The restaurant officially reopened at 129 E. Third St. in South Bethlehem on Thursday, May 19. New owners say they will offer the same delicious cheesesteak that customers know and love. 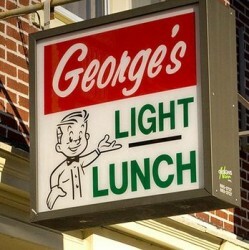 In fact, former owner Ed Mertz will be on-hand to ensure the same high quality George’s is known for. There are some additions to the menu, which include Italian hoagies made with meat from New York, freshly made burgers, paninis, chicken fingers, reubens, tacos, and fresh-cut French fries. Stop by for one of their legendary cheesesteaks or one of their new dishes!